Spot Cool Stuff loves when retired aircraft are put to creative (and environmentally friendly) uses. There’s the Boeing 747 that’s now a hotel in Stockholm. The helicopter B&B in Connecticut. 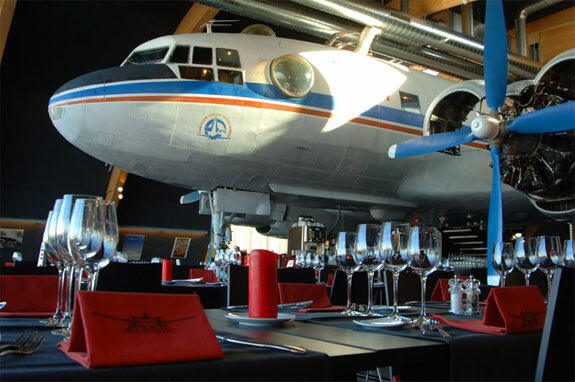 And the former Russian aircraft that takes a Swiss bar and restaurant complex to new heights. 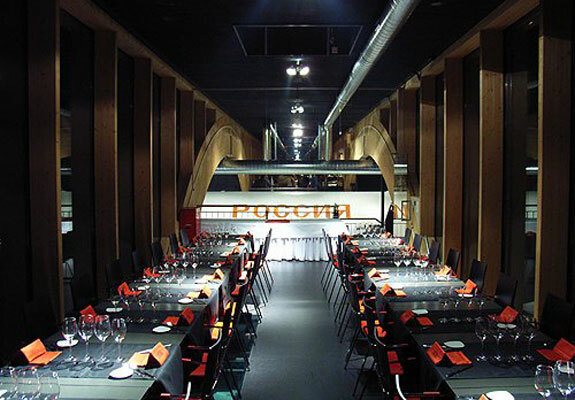 Said Swiss bar and restaurant complex is Runway 34, located adjacent to Zurich International Airport. 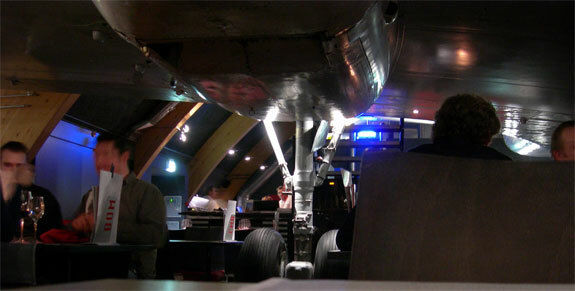 • The Wingwalker Bar – Got a long wait for a flight out of ZRH? Walk past the terminal’s dull drinking holes and head to the Wingwalker; you’ll find the stairs up to it at the rear of the lyushin-14T. Wingwalker is surrounded by windows so you’ll be able to see your flight take off after you’ve lost track of how much time you spent happily drinking here. • The Aviator Lounge – The “lounge” in the name is a bit of a misnomer. 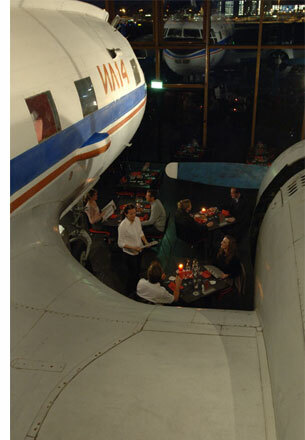 The Aviator serves mostly as the Hangar Restaurant’s overflow and large group seating area. 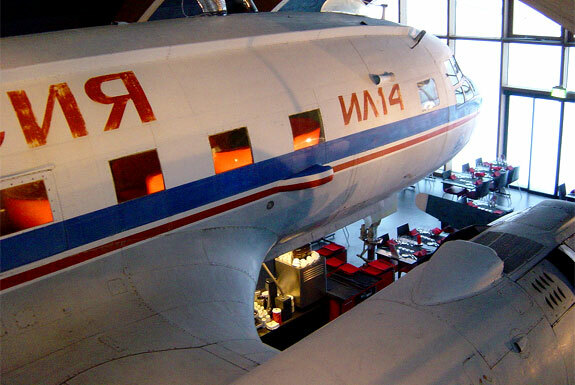 A portion of the lounge’s floor is made of glass allowing patrons to look down upon the left wing of the restaurant’s Ilyushin-14T airplane. 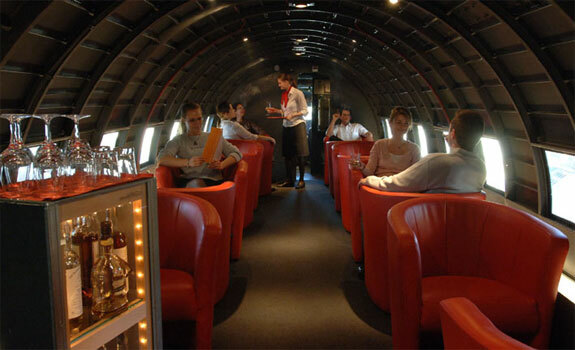 • The Smokers Lounge – Sadly for the nicotine averse, this is the coolest part of Runway 34—it’s inside the airplane! The usual cramped airline seats have been replaced by luxurious red leather chairs. Heavy drinkers will have to bring their own barf bags though much of the cockpit and some of plane’s former electronics remain. 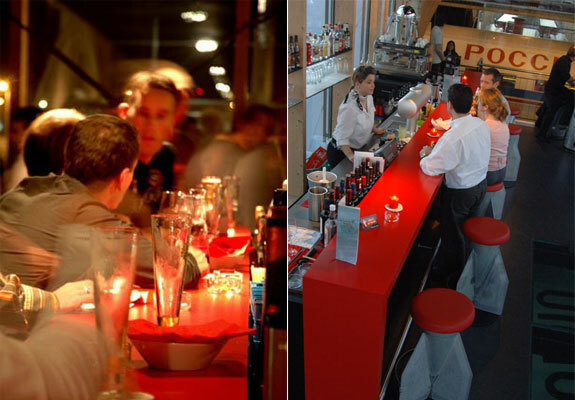 Even if you are in Zurich with no air travel plans it’s worth taking off to ZRH to experience the fun vibe of Runway 34, our runaway choice for the world’s coolest airport bar and restaurant. If you go: Dinner reservations are highly suggested for the Hangar Restaurant and Smokers Lounge, especially on weekend nights—call 043 816 34 34 (some English spoken). For the Aviator Lounge one can show up spontaneously. Where to stay: The Zurich Airport Apart Hotel is the coolest nearby option. 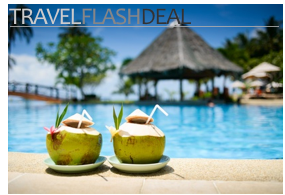 Click here for complete reviews of the best Zurich airport hotels. It is an awesome restaurant theme. This thing shows completely different you than your competitors. A very interesting concept indeed. WOW, that reminds me of my birthday, when Thomas took me there on a lunch treat back in 2007 September. “THANK YOU THOMAS” for that Fabulous birthday gift. I love being around Airplanes and Airports. Runway 34 is a must visit. A different experience all together. Food is simply beyond comparison and so is the Wingwalker Bar. I love this place. Wow, this restaurant looks really cool…and fancy!